The decision to institute a fleet-wide flag upgrade comes amid reports that the PLA Navy is preparing to conduct sea trials of its first aircraft carrier, which is expected to be put into service as early as the end of this year. Although the design will remain the same, the new flags will be bigger and less drab than the old ones, according to a report in the People’s Liberation Army Daily, the official newspaper of the Chinese armed forces. “The size and configuration of the current naval ensign was regulated and released into use in the 1950s and is not commensurate with the tonnage of new-generation vessels and the Navy’s increasing engagement with the state’s foreign affairs,” the paper reported. The PLA has not released the percentage increase in size of the flags, saying only that it would now meet “international standards”. 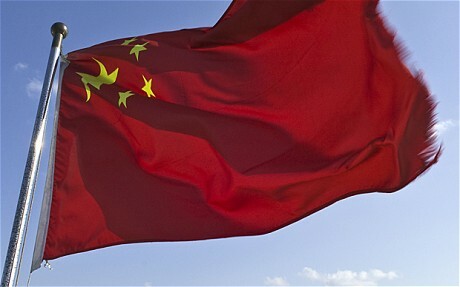 The design â€“ a red flag atop blue and white naval stripes, with a yellow star, denoting the Communist Party, and the Chinese characters for “eight” and “one”, commemorating the PLA’s founding on August 1 1927 â€“ will remain unchanged. China is currently spending billions of dollars upgrading its armed forces, including the creation of a blue-water navy that can protect China’s global interests which have grown rapidly as China goes overseas to secure raw materials for its economic miracle. Analysts say that China has plans to build up to five aircraft carriers flotillas â€“ three conventional and two nuclear-powered â€“ by 2020, with some reports saying that preparations to build China’s first indigenous carrier have already begun in Shanghai’s Changxingdao shipyard. China is currently refurbishing a 66,000 ton Soviet-era Kuznetsov class carrier, the Varyag, which it bought from Ukraine and will re-christen the Shi Lang, after a 17th century Chinese general who conquered what is now Taiwan in 1861. Officially, China will not comment on its carrier program. Last month the PLA held its first ever regular press conference, but when asked about the Varyag, the spokesman said he had “no information” on the ship.